Many agamas resemble iguanas in having erectable dewlaps which course down the middle of the throat. 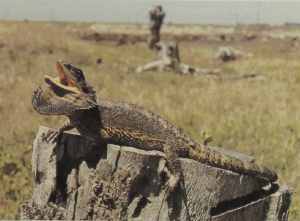 The bearded lizard has gone this one better and spreads the cartilages of the throat into a horizontal fan that may be stretched in all directions. While iguanas generally place themselves sideways to one another during display, the bearded lizards display head-on. They open their mouth wide, gasp, and jump forward with throat fan extended. They are relatively large lizards, about 2Vi feet long. Several related species occur over all of Australia except in the extreme north. The females produce between eight and 27 eggs which are buried in a hole much deeper than the animal is long. Young bearded lizards feed on insects; as they mature, they take first lizards and rodents and then plant material. Like some other lizards, these agamids can warm up much faster than they cool down, as they selectively pump their blood through the warm portions of the skin and slow down the blood-flow through cool areas.